A mother’s words have incredible power — they have the power to give her children a better life. So what are the wise words a mom should say? In Wise Words Mom, author Nancy Jergins shares the powerful words mothers can start saying today. She gives moms specific messages to share with their children, and the simple phrases they can use to convey them. Nancy also shows moms how to use these life-changing, life-saving, wise words with children of all ages. 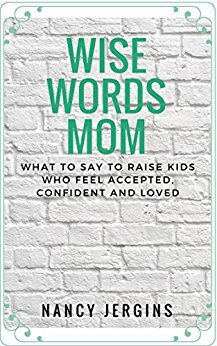 This short and valuable book can help you become a wise words mom for your sons and daughters. Your words can help them feel accepted, confident, and loved. And isn’t that what all mothers want for their children?